In fortification architecture, a rampart is a length of bank or wall forming part of the defensive boundary of a castle, hillfort, settlement or other fortified site. 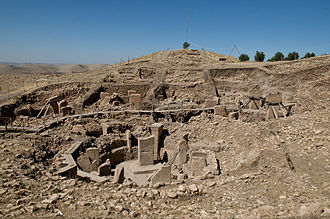 It is usually broad-topped and made of excavated earth or masonry or a combination of the two. 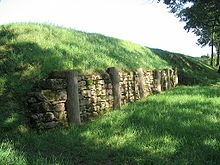 Many types of early fortification, from prehistory through to the Early Middle Ages, employed earth ramparts usually in combination with external ditches to defend the outer perimeter of a fortified site or settlement. Hillforts, ringforts or "raths" and ringworks all made use of ditch and rampart defences, and of course they are the characteristic feature of circular ramparts. The ramparts could be reinforced and raised in height by the use of palisades. 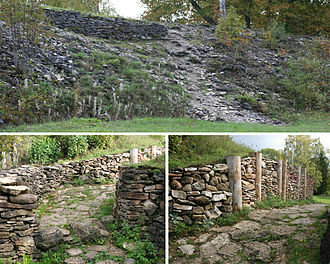 This type of arrangement was a feature of the motte and bailey castle of northern Europe in the early medieval period. During the classical era, societies became sophisticated enough to create tall ramparts of stone or brick, provided with a platform or wall walk for the defenders to hurl missiles from and a parapet to protect them from the missiles thrown by attackers. 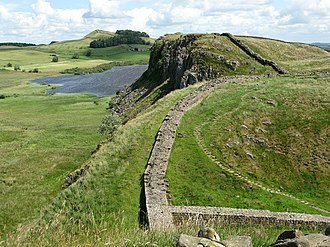 Well known examples of classical stone ramparts include Hadrian's Wall and the Walls of Constantinople. 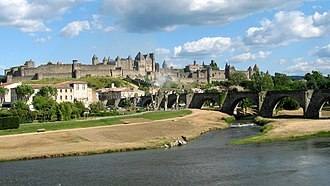 The rampart of the Cité de Carcassonne in the Aude department of France. Originally constructed in the 4th century AD by the Romans, they were largely rebuilt in 1240 and heavily restored in the 19th century. After the fall of the Roman Empire in Europe, there was a return to the widespread use of earthwork ramparts which lasted well into the 11th century, an example is the Norman motte and bailey castle. As castle technology evolved during the Middle Ages and Early Modern times, ramparts continued to form part of the defences, but now they tended to consist of thick walls with crenellated parapets. Fieldworks, however, continued to make use of earth ramparts due to their relatively temporary nature. Parapet: a low wall on top of the rampart to shelter the defenders. 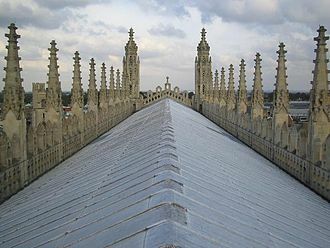 Crenellation: rectangular gaps or indentations at intervals in the parapet, the gaps being called embrasures or crenels, and the intervening high parts being called merlons. Loophole or arrowslit: a narrow opening in a parapet or in the main body of the rampart, allowing defenders to shoot out without exposing themselves to the enemy. Chemin de ronde or wallwalk: a pathway along the top of the rampart but behind the parapet, which served as a fighting platform and a means of communication with other parts of the fortification. Machicolation: an overhanging projection supported by corbels, the floor of which was pierced with openings so that missiles and hot liquids could be thrown down on attackers. Brattice: a timber gallery built on top of the rampart and projecting forward from the parapet, to give the defenders a better field of fire. The rampart of the artillery fortress at Peschiera del Garda in Italy, which was rebuilt in the trace italienne style in 1549. In response to the introduction of artillery, castle ramparts began to be built with much thicker walling and a lower profile, one of earliest examples first being Ravenscraig Castle in Scotland which was built in 1460. In the first half of the 16th century, the solid masonry walls began to be replaced by earthen banks, sometimes faced with stone, which were better able to withstand the impact of shot; the earth being obtained from the ditch which was dug in front of the rampart. At the same time, the plan or "trace" of these ramparts began to be formed into angular projections called bastions which allowed the guns mounted on them to create zones of interlocking fire. This bastion system became known as the trace italienne because Italian engineers had been at the forefront of its development, although it was later perfected in northern Europe by engineers such as Coehoorn and Vauban and was the dominant style of fortification until the mid-19th century. 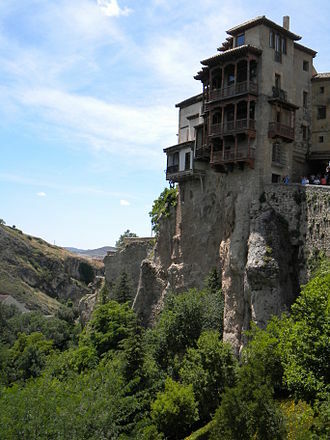 Exterior slope: the front face of the rampart, often faced with stone or brick. Interior slope: the back of the rampart on the inside of the fortification; sometimes retained with a masonry wall but usually a grassy slope. Parapet (or breastwork) which protected and concealed the defending soldiers. Banquette: a continuous step built onto the interior of the parapet, enabling the defenders to shoot over the top with small arms. Barbette: a raised platform for one or more guns enabling them to fire over the parapet. Embrasure: an opening in the parapet for guns to fire through. Terreplein: the top surface or "fighting platform" of the rampart, behind the parapet. Traverse: an earthen embankment, the same height as the parapet, built across the terreplein to prevent it being swept by enfilade fire. Casemate: a vaulted chamber built inside the rampart for protected accommodation or storage, but sometimes pierced by an embrasure at the front for a gun to fire through. Bartizan (also guérite or echauguette): a small turret projecting from the parapet, intended to give a good view to a sentry while remaining protected. As well as the immediate archaeological significance of such ramparts in indicating the development of military tactics and technology, these sites often enclose areas of historical significance that point to the local conditions at the time the fortress was built. ^ a b c d e Darvill, Timothy (2008). Oxford Concise Dictionary of Archaeology, 2nd ed., Oxford University Press, Oxford and New York, p. 376. ISBN 978-0-19-953404-3. ^ Curl, James Stevens (2006). Oxford Dictionary of Architecture and Landscape Architecture, 2nd ed., OUP, Oxford and New York, p. 622. ISBN 978-0-19-860678-9. 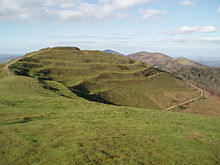 A hillfort or hill fort is a type of earthworks used as a fortified refuge or defended settlement, located to exploit a rise in elevation for defensive advantage. They are typically European and of the Bronze and Iron Ages, some were used in the post-Roman period. The fortification usually follows the contours of a hill, consisting of one or more lines of earthworks, with stockades or defensive walls, and external ditches. Hill forts developed in the Late Bronze and Early Iron Age, roughly the start of the first millennium BC, the terms hill fort, hill-fort and hillfort are all used in the archaeological literature. They all refer to a site with one or more ramparts made of earth, stone and/or wood. Many small early hill forts were abandoned, with the ones being redeveloped at a date. Similar but smaller and less defendable earthworks are found on the sides of hills and these are known as hill-slope enclosures and may have been animal pens. It has been estimated that in about 5000 BC during the Neolithic between 2 million and 5 million lived in Europe, in the Late Iron Age it had an population of around 15 to 30 million. Outside Greece and Italy, which were densely populated, the vast majority of settlements in the Iron Age were small. Hill forts were the exception, and were the home of up to 1,000 people, with the emergence of oppida in the Late Iron Age, settlements could reach as large as 10,000 inhabitants. As the population increased so did the complexity of prehistoric societies, around 1100 BC hill forts emerged and in the following centuries spread through Europe. 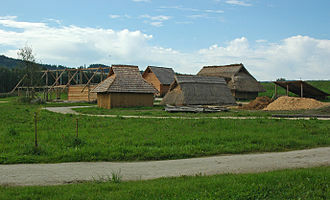 They served a range of purposes and were variously tribal centres, defended places, foci of ritual activity, during the Hallstatt C period, hill forts became the dominant settlement type in the west of Hungary. Julius Caesar described the large late Iron Age hill forts he encountered during his campaigns in Gaul as oppida, by this time the larger ones had become more like cities than fortresses and many were assimilated as Roman towns. Hill forts were occupied by conquering armies, but on other occasions the forts were destroyed, the local people forcibly evicted. A ditch in military engineering is an obstacle, designed to slow down or break up an attacking force, while a trench is intended to provide cover to the defenders. In medieval fortification, a ditch was constructed in front of a defensive wall to hinder mining. When filled with water, such a defensive ditch is called a moat, moats may be dry. Today ditches are obsolescent as an obstacle, but are still often used as anti-vehicle obstacles. A fence concealed in a ditch is called a ha-ha, the inner side of the ditch is called the scarp slope. This may be revetted with masonry or brickwork, in which case, cordon, a course of protruding masonry along the top of a scarp wall, intended to make it harder for an enemy to stand a ladder against it. Rampart, the wall of the fort which can be made of earth or masonry, is topped by a parapet for the defenders to fire over. Berm, a ledge between the wall and the exterior slope of the rampart, designed to increase the stability of the rampart. Faussebraye, a parapet between the rampart and the inner edge of the ditch. A merlon is the solid upright section of a battlement or crenellated parapet in medieval architecture or fortifications. Merlons are sometimes pierced by narrow, vertical embrasures or slits designed for observation, the space between two merlons is called a crenel, and a succession of merlons and crenels is a crenellation. 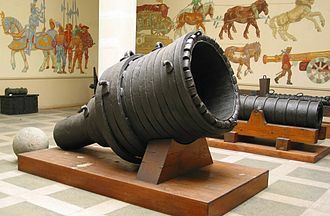 Crenels designed in eras, for use by cannons, were called embrasures. 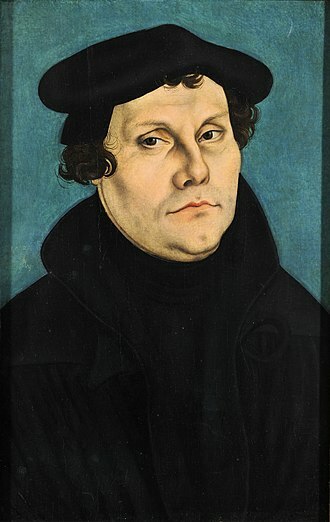 The word comes from the French language, adapted from the Italian merlone, possibly a form of mergola, connected with Latin mergae, or from a diminutive moerulus. An alternative etymology suggests that the medieval Latin merulus functioned as a diminutive of Latin merle, as an essential part of battlements, merlons were used in fortifications for millennia. The best-known examples appear on buildings, where battlements, though defensive, could be attractively formed. Some buildings have false decorative battlements, other shapes include, three-pointed, shielded, flower-like, pyramidal, etc. depending either from the type of attacks expected or aesthetic considerations. Ringforts are circular fortified settlements that were mostly built during the Early Middle Ages up to about the year 1000. They are found in Northern Europe, especially in Ireland, there are many in south Wales and in Cornwall, where they are called Rounds. Ringforts come in sizes and may be made of stone or earth. Earthen ringforts would have been marked by a rampart, often with a stakewall. Both stone and earthen ringforts would generally have had at least one building inside, in Irish language sources they are known by a number of names, ráth, caiseal, cathair and dún. The ráth and lios was an earthen ringfort, the ráth being the enclosing bank, the caiseal and cathair was a stone ringfort. The term dún was usually used for any stronghold of importance, in Ireland, over 40,000 sites have been identified as ringforts and it is thought that at least 50,000 ringforts existed on the island. They are common throughout the country, with a density of just over one ringfort within any area of 2 km2. It is likely that many have been destroyed by farming and urbanisation, many hitherto unknown ringforts have been found thanks to early Ordnance Survey maps, aerial photography, and the archaeological work that has accompanied road-building. 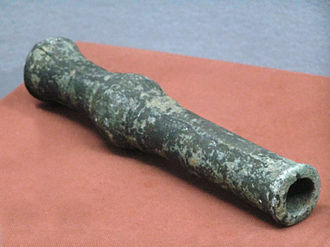 Few Cornish examples have been excavated, with the exception of Trethurgy Rounds. According to the authoritative New History of Ireland, archaeologists are agreed that the vast bulk of them are the enclosures of the well-to-do of early medieval Ireland. The a priori case for attributing some ringforts to the Later Middle Ages. is based on the absence of any other settlement form of date in those landscapes. In other words, if the Gaelic-Irish did not live in ringforts, the conjecture that ringforts can be seen to have evolved from and be part of an Iron Age tradition has been expanded by Darren Limbert. This hypothesis is based on a number of re-interpretations of the available evidence, Limbert argues instead, that the ringfort should be seen in the context of a variety of similar developments in Britain and the European Continent, particularly in Iberia and Gaul. With numerous additions and modifications during their history, they were the last great fortification system of antiquity, and one of the most complex and elaborate systems ever built. Initially built by Constantine the Great, the walls surrounded the new city on all sides, as the city grew, the famous double line of the Theodosian Walls was built in the 5th century. Ultimately the city fell from sheer weight of numbers of the Ottoman forces on 29 May 1453 after a six-week siege. The walls were largely maintained intact during most of the Ottoman period, until sections began to be dismantled in the 19th century, despite the subsequent lack of maintenance, many parts of the walls survived and are still standing today. A large-scale restoration program has been under way since the 1980s, according to tradition, the city was founded as Byzantium by Greek colonists from Megara, led by the eponymous Byzas, around 658 BC. At the time the city consisted of a region around an acropolis. This wall was protected by 27 towers, and had at least two gates, one which survived to become known as the Arch of Urbicius. On the seaward side, the wall was much lower and this wall is known to have been repaired, utilising tomb stones, under the leadership of a certain Leo in 340 BC, against an attack by Philip II of Macedon. 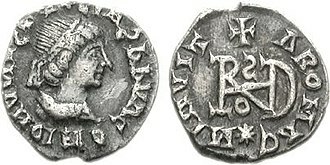 Byzantium was relatively unimportant during the early Roman period, contemporaries described it as wealthy, well peopled and well fortified, but this affluence came to an end due to its support for Pescennius Niger in his war against Septimius Severus. Severus punished the city harshly, the walls were demolished. 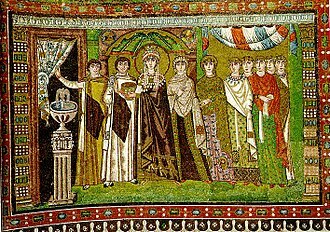 The Patria mention the existence of another wall during the siege of Byzantium by Constantine the Great during the conflict with Licinius. 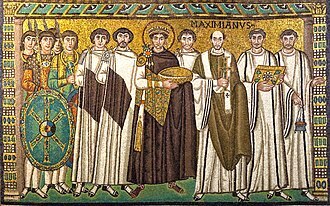 Like Severus before him, Constantine began to punish the city for siding with his defeated rival, during 324–336 the city was thoroughly rebuilt and inaugurated on 11 May 330 under the name of Second Rome. The name that prevailed in common usage however was Constantinople. The city of Constantine was protected by a new wall about 2.8 km west of the Severan wall, constantines fortification consisted of a single wall, reinforced with towers at regular distances, which began to be constructed in 324 and was completed under his son Constantius II. A palisade—sometimes called a stakewall or a paling—is typically a fence or wall made from wooden stakes or tree trunks and used as a defensive structure or enclosure. Typical construction consisted of small or mid-sized tree trunks aligned vertically, the trunks were sharpened or pointed at the top, and were driven into the ground and sometimes reinforced with additional construction. The height of a palisade ranged from around a metre to as high as 3-4 m, as a defensive structure, palisades were often used in conjunction with earthworks. Palisades were an excellent option for small forts or other hastily constructed fortifications, since they were made of wood, they could often be quickly and easily built from readily available materials. They proved to be effective protection for short-term conflicts and were a deterrent against small forces. However, because they were wooden constructions they were vulnerable to fire. 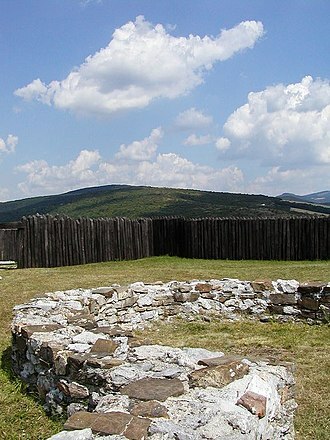 Often, a palisade would be constructed around a castle as a wall until a permanent stone wall could be erected. They were frequently used in New France, both the Greeks and Romans created palisades to protect their military camps. The Roman historian Livy describes the Greek method as being inferior to that of the Romans during the Second Macedonian War, the Greek stakes were too large to be easily carried and were spaced too far apart. This made it easy for enemies to them and create a large enough gap in which to enter. In contrast, the Romans used smaller and easier to carry stakes which were placed closer together, many settlements of the native Mississippian culture of the Midwestern United States made use of palisades. The most prominent example is the Cahokia Mounds site in Collinsville, a wooden stockade with a series of watchtowers or bastions at regular intervals formed a 2-mile-long enclosure around Monks Mound and the Grand Plaza. Archaeologists found evidence of the stockade during excavation of the area and indications that it was several times. The stockade seems to have separated Cahokias main ceremonial precinct from other parts of the city, the English settlements in Jamestown and Plymouth, Massachusetts were originally fortified towns surrounded by palisades. These gaps are termed crenels, and the act of adding crenels to a previously unbroken parapet is termed crenellation. 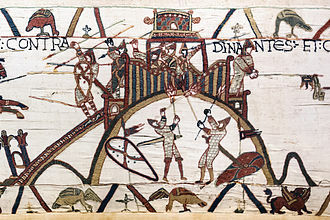 The solid widths between the crenels are called merlons, a wall with battlements is said to be crenelated or embattled. Battlements on walls have protected walkways behind them, on tower or building tops, the roof is used as the protected fighting platform. The term originated in about the 14th century from the Old French word batailler, the word crenel derives from the ancient French cren, Latin crena, meaning a notch, mortice or other gap cut out often to receive another element or fixing, see crenation. In medieval England a licence to crenellate granted the permission to fortify their property. The castles in England vastly outnumber the licences to crenellate, royal pardons were obtainable, on the payment of an arbitrarily determined fine, by a person who had fortified without licence. 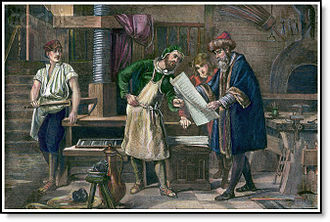 The surviving records of such licences, generally issued by letters patent, there has been academic debate over the purpose of licensing. The view of military-focused historians is that licensing restricted the number of fortifications that could be used against a royal army and they indicated to the observer that the grantee had obtained royal recognition and compliment. The crown usually did not charge for the granting of such licences, battlements have been used for thousands of years, the earliest known example is in the fortress at Buhen in Egypt. Battlements were used in the walls surrounding Assyrian towns, as shown on bas reliefs from Nimrud, traces of them remain at Mycenae in Greece, and some ancient Greek vases suggest the existence of battlements. The Great Wall of China has battlements, late merlons permitted fire from the first firearms. 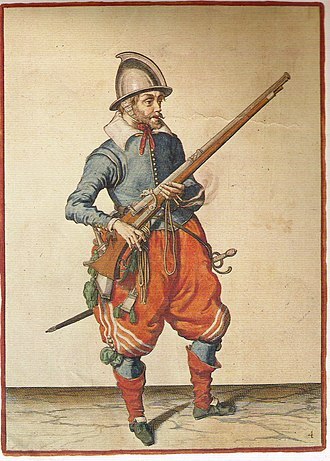 From the 13th century, the merlons could be connected with wooden shutters that provided added protection when closed, the shutters were designed to be opened to allow shooters to fire against the attackers, and closed during reloading. The Romans used low wooden pinnacles for their first aggeres, in the battlements of Pompeii, additional protection derived from small internal buttresses or spur walls, against which the defender might stand so as to gain complete protection on one side. A parapet is a barrier which is an extension of the wall at the edge of a roof, balcony, walkway or other structure. The word comes ultimately from the Italian parapetto, the German equivalent Brustwehr has the same meaning. Parapets were originally used to defend buildings from attack, but today they are primarily used as guard rails. Parapets may be plain, perforated or panelled, which are not mutually exclusive terms, plain parapets are upward extensions of the wall, sometimes with a coping at the top and corbel below. Embattled parapets may be panelled, but are pierced, if not purely as stylistic device, perforated parapets are pierced in various designs such as circles, trefoils, or quatrefoils. Panelled parapets are ornamented by a series of panels, either oblong or square, and more or less enriched and these are common in the Decorated and Perpendicular periods. The Mosaic law prescribed parapets for newly constructed houses as a safety measure, the Mirror Wall at Sigiriya, Sri Lanka built between 477 and 495 AD is one of the few surviving protective parapet walls from antiquity. Built onto the side of Sigiriya Rock it ran for a distance of approximately 250 meters and provided protection from inclement weather. Only about one hundred meters of this exists today, but brick debris. 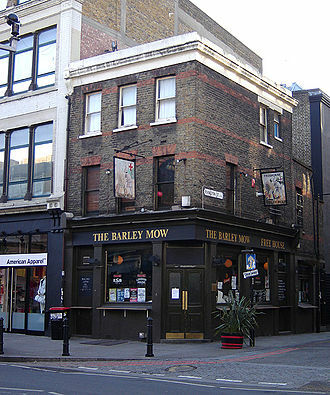 Parapets surrounding roofs are common in London and this dates from the Building Act of 1707 which banned projecting wooden eaves in the cities of Westminster and London as a fire risk. Instead an 18-inch brick parapet was required, with the set behind. This was continued in many Georgian houses, as it gave the appearance of a roof which accorded with the desire for classical proportions. Many firewalls are required to have a parapet, a portion of the wall extending above the roof, the parapet is required to be as fire resistant as the lower wall, and extend a distance prescribed by building code. Parapets on bridges and other highway structures prevent users from falling off where there is a drop and they may be meant to restrict views, to prevent rubbish passing below, and to act as noise barriers. Maiden Castle in England is one of the largest hillforts in Europe. Photograph taken in 1935 by Major George Allen (1891–1940). Carcassonne, préfecture of the department traversed by the Aude river. Bartizan at Fort de Chartres, a French colonial era fort in Illinois on the Mississippi River. 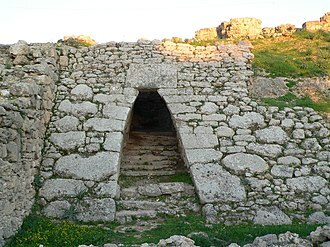 Photo of the peribolos, the space between the inner and outer walls. Modern photograph of the Golden Gate, showing the two flanking towers. The top of the walled-up central arch is also visible. Surviving fragments of the statues decorating the outer gate of the Golden Gate complex, from the Istanbul Archaeological Museum. A ditch and earth bank at Old Sarum, near Salisbury in England, dating from the Iron Age. Ditch of Valletta, which was built between 1566 and the 1570s.